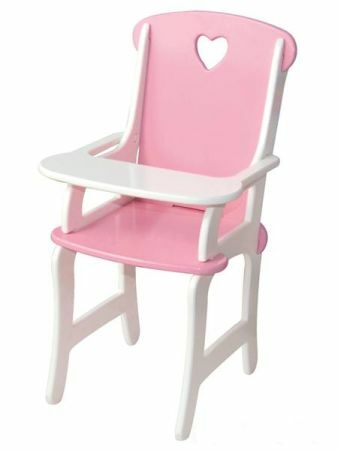 Wooden Toy Doll Highchair is a lovely pink and white creation with a tray table which lifts up and down so it is easy to get dolly ready for feeding. This Doll Highchair is very well designed and slots together without any screws or bolts so it is easy to set up and if necessary take apart for storage. Solid and very well finished this clever little highchair is a wonderful roleplay toy for dolls and teddies. We like this because: "Very clever design just slots together. " Love all the wooden toys. Workmanship is excellent. Easy to use the web page and order items.